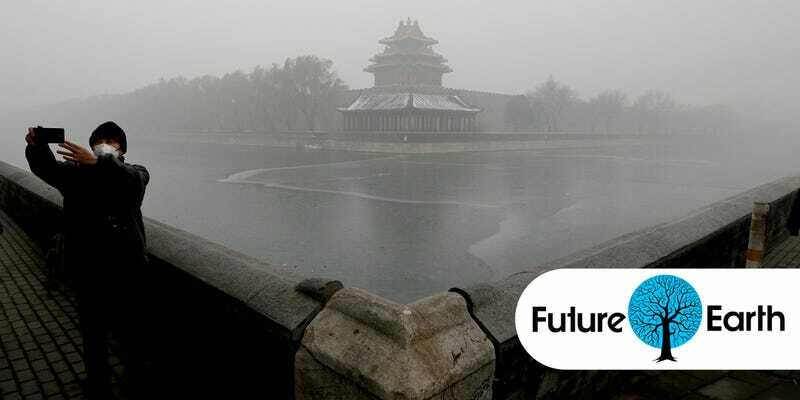 Beijing is currently choking on a thick smog, with air pollution in the city over 20 times the safe levels defined by the World Health Organisation. This is what it looks like. As the world’s governments gather in Paris to decide the future of our planet, there’s an all too obvious reminder of pollution hanging above Beijing. The thick brown-yellow smog doesn’t just look horrible, either: the air quality index was measured by the U.S. Embassy in Beijing on Monday to be 611 for what’s referred to as small particulate matter. For some context, in the U.S., levels above 100 are considered unhealthy; at levels above 200 the entire population is at risk from suffering health effects; and above 300 the entire population is at risk of ‘serious’ health effects. The U.S. scale tops out at 500. Authorities in China have blamed unusual weather for the smog, which is at least partly true. Temperatures are currently much lower than usual for the time of year in northern China, which has seen the poor light coal fires and the more wealthy switch on central heating powered by electricity from coal-fuelled power stations. Those emissions, combined with stagnant air pressure, have led to the smog you see in these images. Those same authorities issued an orange air quality alert on Sunday, which has seen factories shut down production in an attempt to reduce emissions. It’s hoped winds will pass across northern China in the next few days and help clear the smog. Earlier this year, it came to light that China has been burning up to 17 percent more coal than its Government has previously claimed — pumping up to 1 billion more tons of carbon than expected into the atmosphere every year. Its officials have, however, admitted that the country has a “duty to humanity” to clean itself up.